Plagiarism is the act of plagiarizing or taking another person’s writing, conversation, song, or even idea and passing it off as your own without permission. Make sure that you do not copy verbatim more than two words in a row from the text you have consulted. If you do use more than two words together, you will have to use quotation marks. We will get into quoting properly soon. Therefore, Cite – Citing is one of the effective ways to “avoid plagiarism”. Paraphrasing is using your own words to express someone’s idea. It is also a restatement of the meaning of a text or passage using other words. A paraphrase typically explains or clarifies the text that is being paraphrased. For example, “The signal was red” might be paraphrased as “The train was not allowed to pass because the signal was red”. A paraphrase is usually introduced with verbum dicendi-a declaratory expression to signal the transition to the paraphrase. For example, in “The signal was red, that is, the train was not allowed to proceed,” that is, signals the paraphrase that follows. a) Original Sentence: Her life spanned years of the incredible change of women. b) Paraphrased Sentence: Many lived through an era of liberating reform for women. Citing means “to quote or refer to” (a book or author, for example) as an authority or example in making an argument. Citing is one of the effective ways to avoid plagiarism. Follow the document formatting guidelines (i.e. APA, MLA, Chicago, etc.) used by your educational institution or the institution that issued the research request. This usually entails the addition of the author(s) and the date of the publication or similar information. Citing is really that simple. Not citing properly can constitute plagiarism. When quoting a source, use the quote exactly the way it appears. No one wants to be misquoted. Most institutions of higher learning frown on “block quotes” or quotes of 40 words or more. A scholar should be able to effectively paraphrase most material. This process takes time, but the effort pays off! Quoting must be done correctly to avoid plagiarism allegations. Citing a quote can be different than citing paraphrased material. This practice usually involves the addition of a page number, or a paragraph number in the case of web content. If some of the material you are using for your research paper was used by you in your current class, a previous one, or anywhere else you must cite yourself. Treat the text the same as you would if someone else wrote it. It may sound odd, but using material you have used before is called self-plagiarism, and it is not acceptable. One of the most important ways to avoid plagiarism is including a reference page or page of works cited at the end of your research work. Again, this page must meet the document formatting guidelines used by your educational institution. This information is very specific and includes the author(s), date of publication, title, and source. Follow the directions for this page carefully. You will want to get the references right. Always be sure to edit your work carefully and check for plagiarism before submitting it to your supervisor. The steps above are essentials for research work writing. Using plagiarism checker services such as “Write Check” is a great way to assess your paraphrasing and other anti-plagiarism skills. Most educators and educational institutions are using some kind of plagiarism checker software to check students’ research works. Do not take the chance of not checking your research work. 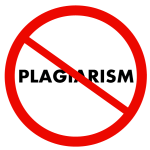 Plagiarism could mean the loss of your academic degree or career.